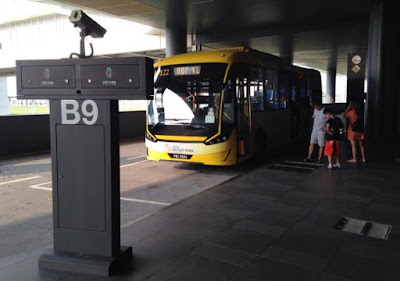 If you are going to Mitsui Outlet Park from KLIA, the bus stop for free shuttle bus to Mitsui Outlet is located at KLIA main terminal Level 1, Gate 2, EXIT DOOR 2, as shown in the image below. 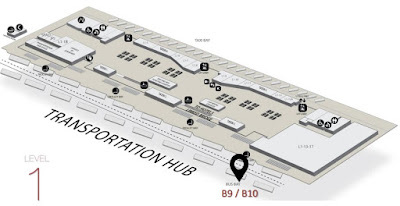 If you want to go to Mitsui Outlet Park from KLIA2, the first of all you need to go down to the transportation hub at Level 1 (where the taxis and buses are). 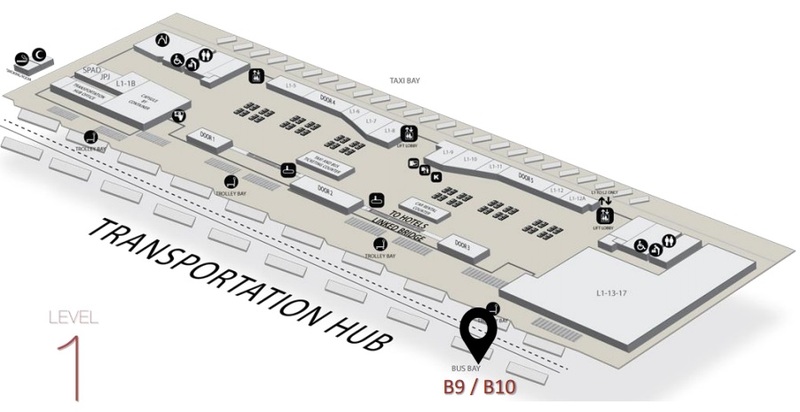 The bus stop for the free shuttle bus is located at Transportation Hub Level 1, Car Park Bay B9/ B10, EXIT DOOR 3, as shown in the location map below. There are 41 free bus trip from KLIA and KLIA2 to Mitsui Outlet Park everyday, including Sunday and Monday. The first bus departs from KLIA2 at 8:30am and KLIA at 8.40am. The frequency of the bus departure is every 20 minutes from 8:30am until 10:10pm at night. From 10:10pm to 11:10pm, the bus frequency from KLIA2 and KLIA to Mitsui Outlet is every 30 minutes. The last bus to Mitsui Outlet departs from KLIA2 at 11:10pm and KLIA at 11:20pm. 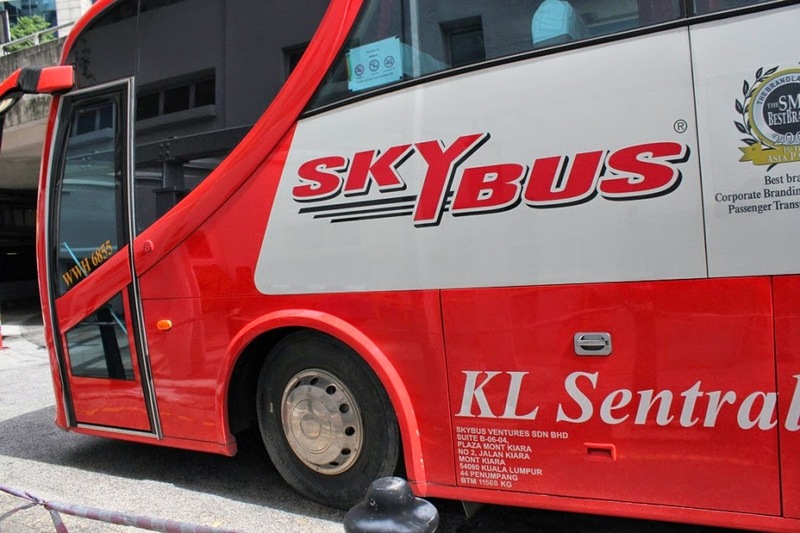 Similarly, 41 free shuttle bus trips will transport passengers from Mitsui Outlet to KLIA and KLIA2 everyday, including weekend and public holidays. The first bus departs from Mitsui Outlet Park at 8:20am. The frequency of the bus departure from Mitsui Outlet Park is every 20 minutes from 8:20am until 10:00pm at night. After that, the free shuttle bus frequency will be every 30 minutes. The last bus to KLIA and KLIA2 departs from Mitsui Outlet at 11:00pm. Mitsui Outlet closes at that time. Therefore, no further bus service is available after this time. Shopping at branded outlets with great discount and bargain price. That is why most people (both local and foreigners) like to go to Mitsui Outlet. If you are tourist, take advantage of special discounts and shopping privilege by getting the Tourist Privilege Pass at the Information Center at Ground Floor of Mitsui Outlet after arriving from KLIA or KLIA2. If you have a lot baggages with you, do not worry. Here is an important tips for you. You can store your baggages for free at Mitsui Outlet Luggage Storage area before you proceed for your shopping spree. Don't forget to get your baggage back before you leave Mitsui Outlet to go back to KLIA or KLIA2. If you are late for flight check-in, do not worry. You can do self check-in at Mitsui Outlet. They let you print your boarding pass too but make sure that you are back to KLIA or KLIA2 to catch your flight. Again, check the timetable for the free shuttle bus from Mitsui Outlet to KLIA and KLIA2 in advance. 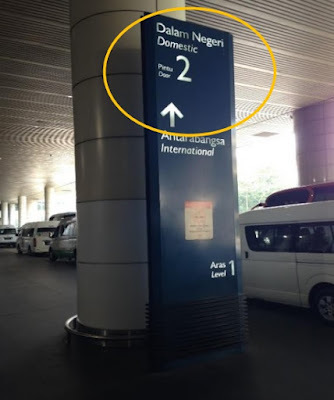 Of course, you can always drive from KLIA or KLIA2 if you have a car or you are renting a car. Having said that, shuttle bus from KLIA and KLIA2 to Mitsui Outlet Park Sepang is still the best way as it is free and you do not have to worry about finding parking.